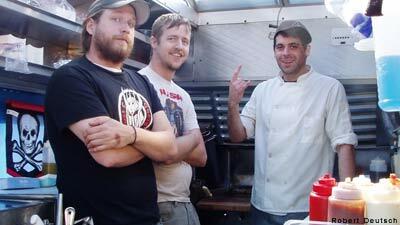 A mutual love of heavy metal and hardy meals fuels Chef Ryan Harkins, Matt Chernus, and Dustin Dillard, the three metalheads that make up the crew of Los Angeles' Grill 'Em All burger truck. And if you happened to be in front of the Prosthetic Records Los Angeles offices at Venice Blvd. on Jan. 7, the tandem of delicious food and devilish tunes was more than apparent. A soundtrack from Skeletonwitch and the Funeral Pyre paired up nicely with the devilishly gourmet mobile menu. "The truck was the best, sound idea. We wanted to open a restaurant, but I didn't have the credit rating," Harkins told Noisecreep, laughing, of the band of brothers' ultimate goal for culinary conquest. "Even when Ryan was barbecuing in backyards, he still used the same ingredients." Chernus, in turn, informed Noisecreep about the higher-end menu items used by Grill 'Em All. "If there's a keg and a grill, Ryan will do your barbeque." Harkins was quick to reminisce about a red wine reduction with sautéed strawberries and goat cheese topping for a burger, something most metalheads might not think of in the backyard, let alone at the burger joint down the street. Childhood friends, Chernus and Harkins played in bands together over the years (Harkins still fronts Long Beach's Sumerian Axe) and were recently joined by Dillard through a mutual friend from the duo's hometown of Cleveland. Chalk up Harkins' culinary career -- 10 years of professional kitchen experience in fine dining establishments in several major cities. "Long enough to know my way around the kitchen," he assured Noisecreep. With a mutual love for metal and that expierience, it's suddenly apparent that -- with items like the Molly Hatchet burger (with seared fennel, applewood smoked bacon with a maple drizzle), the Kreator apple kraut and summer sausage combo or the Behemoth smoked cheddar and beer-soaked onions -- this mobile meatwagon's menu makes a little more sense. The allure of the menu isn't solely limited to the metal-minded, though. "Sometimes we get timid customers. The straight, normal people," Harkins told Noisecreep. "But I think the food speaks for itself. Like when we cook for 100 people at a corporate event with the pirate flag out front." Chernus added, "I think people like to be in on the joke, too ... Not that it's a joke." This truck is legit. "We're just not your garden variety burger truck," Harkins agreed, almost finishing his friend's sentence. At the offices of Century Media and Nuclear Blast in Hawthorne, just south of Los Angeles proper, then in front of the Prosthetic Records office on Venice Blvd. in West L.A. the next day, and over to the Steve Allen Theatre in Los Angeles Jan. 8 for the screening premiere of Exodus' forthcoming DVD, the Grill 'Em All gang has been keeping more than busy since the truck went into commission in mid-December; this is now a full-time operation for the trio. "We usually have 16, 18 hour days," Chernus told Noisecreep. "Sure, we might be cooking for only six hours, but with prep, driving and clean up, it does get pretty ridiculous." While it may be a big time investment for the guys, hungry headbangers are sure to appreciate it in and around Los Angeles; Grill 'Em All plans on making semi-regularly stops at familiar haunts in the near future, and possibly a second truck, hoping for repeat business and casual intrigue from the non metal-minded alike. If the paint job, pirate flag, megaphone, and blaring soundtrack (the boombox and 'Now Slaying' sign will let passersby know what their ears are bleeding from) doesn't grab your attention, the food surely will. Just make sure to check out the specials for the day -- those rotate regularly, so each visit should offer ravenous rockers a new experience.